Crank the RV window open to give yourself working room. Remove the crank screw and crank. Remove the screen. Remove the four screws holding the operator. Lift up the operator. This will take the tension of the torque tubes, which can them be taken out of the operator. Slip the torque tubes into the sides of the new operator, noting the position of the notches in the rube ends. As necessary, rotate the operator shaft and move the vents so that the torque tubes fit snugly into the operator sides. Press downward on the operator to reset it in the center of the windowsill. 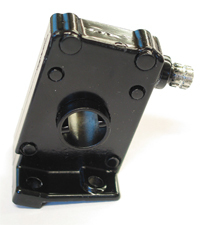 Align the mounting holes and replace the screws, thereby securing the operator into place. Slide the crank onto the operator shaft and open and close the vents to check for smooth operation. If satisfactory, replace the screen, operator crank and screw.